Do you still get blank stares from people when you say that you have Marfan syndrome? How many times have you been asked, “How do you spell that? M-A-R.......how frustrating! Ask your local library if you can set up a Marfan awareness table for a day or two and share information about Marfan syndrome with members of your community. Contact your local high school about giving a presentation to biology or genetics classes about Marfan syndrome. Send Valentine Day cards (or emails) to your friends and relatives and include information about Marfan syndrome and related disorders. Share some basic facts about related disorders, too, because these have overlapping signs and treatments with Marfan syndrome and can also cut lives short. Write a “letter to the editor” of your local paper about what Marfan syndrome is and why it matters to you, and ask them to publish the letter or do an article. Suggest they interview you about your medical journey and point them to Marfan.org for medical information. 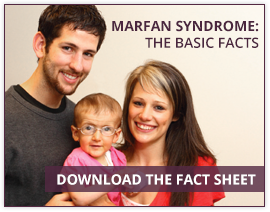 Share facts about Marfan syndrome and related disorders on Facebook, Twitter, and all the social media platforms you are on throughout the month of February. Check out our Facebook page and Twitter feed every day of the month for information, pictures, and videos you can share. Get all “doctor” on your doctor; ask him or her to check out the healthcare professionals section of our website, especially our MarfanDX diagnostic tool, which many doctors find useful for evaluating the signs of Marfan syndrome. "The first time I helped at a Marfan awareness table I just hoped to spread knowledge. I continue to help every year because of heart, community and love. Victory is knowledge," said Becki Wetzel, Daytona Beach, FL (pictured above). The time to plan for February is now! If you need help, or more ideas about what you can do, just download the step-by-step guides from our website. And you can always contact us at volunteer@marfan.org with any questions. How are you going to raise awareness of Marfan syndrome and related disorders in February?